For fashion fanatics, visiting Huset Olholm is a must when in Billund. 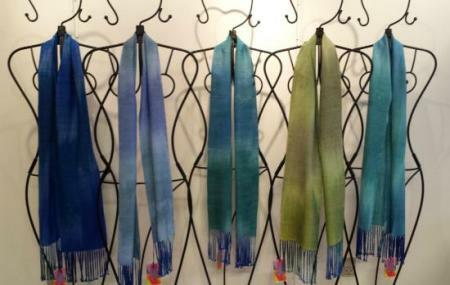 It is a workshop where textile artist Bodil Olholm uses traditional crafts used in Denmark since the Bronze Age, to create beautiful unique handmade silk scarves and shawls in vibrant colours. Take back some custom made scarves and shawls for your friends and family members as well. Entrance free. Product prices differ. Vestergade v. Nørretorv (Grindsted) bus stop. Love this? Explore the entire list of places to visit in Billund before you plan your trip. Fancy a good night's sleep after a tiring day? Check out where to stay in Billund and book an accommodation of your choice. How popular is Huset Olhom? People normally club together Nollund Church and Karensminde Agricultural Museum while planning their visit to Huset Olhom.